In The Night the Moon Went Missing, written by Shreya Yadav and illustrated by Sunaina Coelho, a young girl sets out on a grand adventure to find her missing friend. 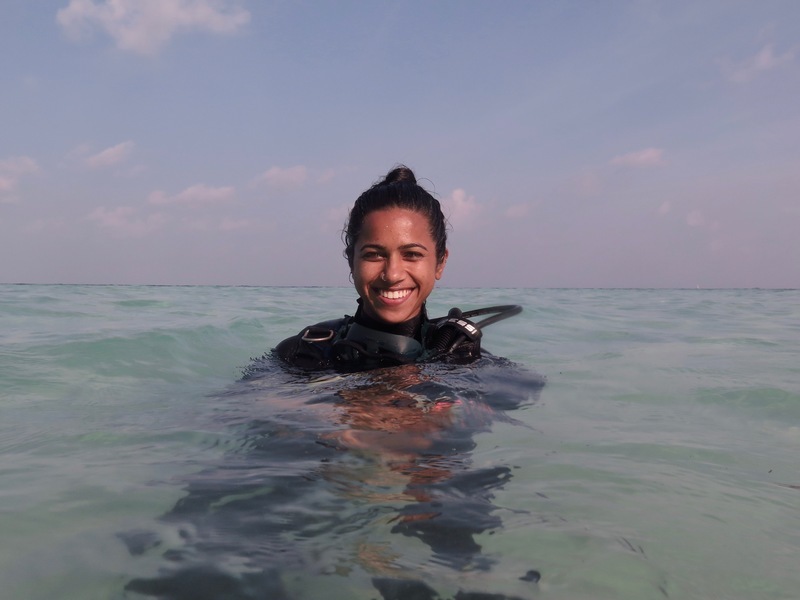 Shreya is a marine biologist who studies coral reefs. One of her favourite things to do is cling onto a rock underwater and spy on all the fish and plants and crabs and coral that live there. 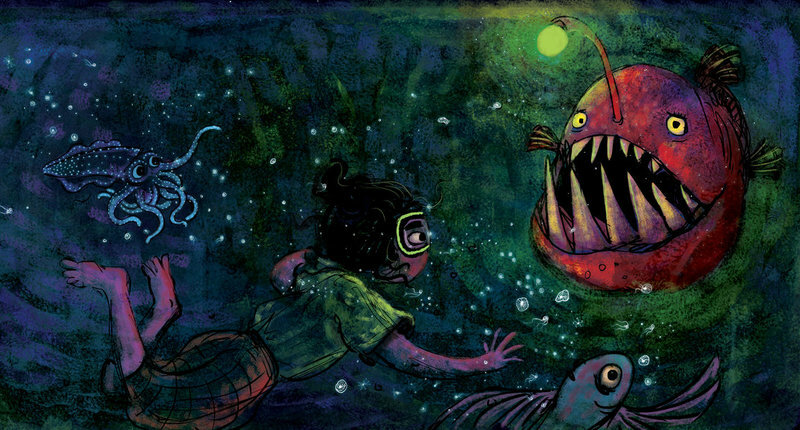 In this short interview, Zeba Imtiaz, assistant editor at Pratham Books, talks to Shreya about life under water, her favourite children's books and the process of writing The Night the Moon Went Missing, a truly enchanting picture book. How did your interest in the ocean and creatures in the ocean begin? Growing up in Madras, the Bay was always quite central to our lives. My brother and I would trot off to the beach every other day after school and spend hours in the water. We lived very close by - there was always a sliver of the ocean visible from our balcony - so I think we took the salt and sand for granted. I started diving when I was 19 on a family holiday to the Andaman islands. My father, who SCUBA dives, asked if I wanted to do my beginner course at Havelock island. I remember seeing an octopus and an eel and all kinds of other impossibly bizarre life on my first dive and being totally blown away. Even though I was studying zoology at the time, that was the first time I really wondered about the ecology of a coral reef without it being some kind of abstract concept. If you had to pick, which would be your favourite ocean creature, and why? I definitely have a thing for the small and cryptic critters that live on a reef. Often, I will be swimming over something, and will catch a tiny eye peering at me from behind something. I always wonder what their lives are like. 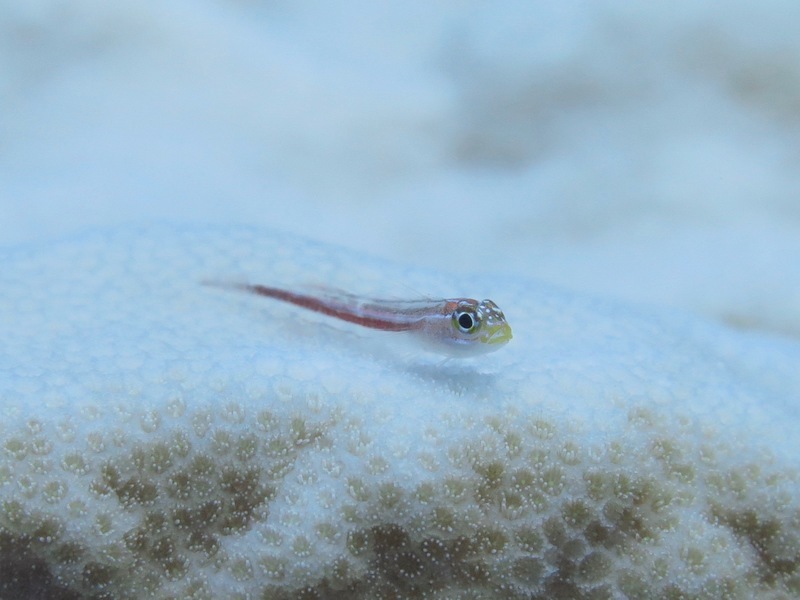 Blennies and gobies are probably my favourites. What sort of books did you read as a child? What was your favourite book growing up? I was lucky to grow up with great books and a family that enjoyed dramatic readings of them! I remember being obsessed with Ekki-Dokki (Sandhya Rao; Tulika) when I was very little and then by a book called Trash! (Anushka Ravishankar and Gita Wolf; Tara Books) when I was a bit older. I also read a lot of Roald Dahl. I think I found Quentin Blake's illustrations very weird as a kid, but there was something so different about them that it was hard to put down. What was your writing process for your book The Night the Moon Went Missing? I think we had discussed that bioluminescence would be an interesting topic to explore for this book, but the story actually took a while to come. I knew I wanted it to be taking place on an island and I had a list of creatures I thought were interesting in terms of their biology, but I didn't know how to make it all come together. I think it finally came to me after a few conversations on the phone with friends - saying things out loud always helps. Later, when I read the first draft out to my parents, my mother told me it reminded her of a story my great-grandmother had written for children which also involved the moon and three young girls on a nighttime adventure. As soon as she said it I remembered that book. Now I feel like I subconsciously plagiarized my great-grandmother! What was you favourite part of writing this story? What was the most challenging bit? I had so much fun writing this. I think the most challenging bit was trying to stick to the word limit - I was worried that it would be hard to visualize in so few words, since it was all taking place underwater at night with a bunch of strange glowing animals. But Sunaina's beautiful illustrations more than took care of that. I think my favourite thing about the book now are her illustrations. If you were to write another children's book, what would it be about? I think it would be fun to profile a bunch of marine critters in limerick form, Ogden Nash style. Do you think your childhood was different from how children live today? I'm not sure - I have a feeling everyone who is asked this question will probably say yes. I remember having a lot of time in the day to play and climb trees and run around the beach and I hope that that is still the case today. Who are some of the authors you enjoy reading today? Big fan of Italo Calvino, Jorge Luis Borges, Loren Eisley, Peter Godfrey-Smith, Robert Macfarlane, WS Merwin. Closer to home, I really like the work of Sonali Zohra, Renuka Rajiv, Vinayak Varma, Orijit Sen, Sarnath Banerjee and the geniuses behind Crocodile in Water, Tiger on land - whoever they are. Have you read The Night the Moon Went Missing? It is available on StoryWeaver for free, in English, Kannada, Marathi, Tamil and Hindi, and will soon be available in print.